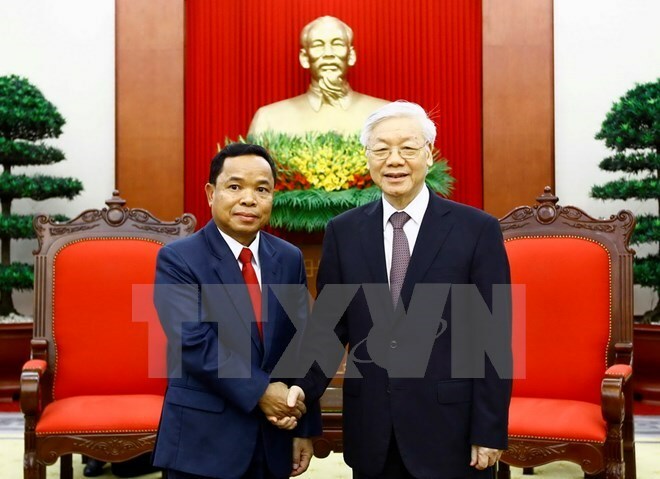 Hanoi (VNA) – Party General Secretary Nguyen Phu Trong has emphasised the significance of Vietnam-Laos traditional friendship, special solidarity and comprehensive cooperation to the Parties and people of the two countries. During a reception in Hanoi on August 21 for Khamphanh Phommathat, Politburo member, Secretary of the Lao People’s Revolutionary Party (LPRP) Central Committee and head of the LPRP Central Committee Office, General Secretary Trong hailed the Lao delegation’s visit at a time when the two countries are celebrating the 55th anniversary of diplomatic ties and 40 years since the signing of the Vietnam-Laos Treaty of Amity and Cooperation. He spoke highly of cooperation between the Offices of the Communist Party of Vietnam (CPV) Central Committee and the LPRP Central Committee in the recent past and the outcomes of their freshly-ended working session. The Vietnamese Party leader expressed wish that the two offices would continue working closely together and share experience and professionalism to fulfill their assigned tasks and effectively implement the bilateral cooperation agreement for 2017-2020 and an action plan to carry out the cooperation programme on records management, archives and library. Phommathat informed the host about the recent situation in Laos, including the implementation of the Resolution approved at the 10th National Congress of the LPRP, and the outcomes of collaboration between the two offices over the past years and the talks during the visit.